The Congress today criticised the government for not objecting to the US reference to "Indian- administered Jammu and Kashmir" in designating Hizbul Mujahideen chief Syed Salahuddin as a global terrorist. Congress slams government for not objecting to US reference to "Indian-administered Jammu and Kashmir". New Delhi: The Congress today criticised the government for not objecting to the US reference to "Indian- administered Jammu and Kashmir" in its statement designating Hizbul Mujahideen chief Syed Salahuddin as a global terrorist. "Shocking that US government order on Syed Salahuddin refers to 'Indian Administered J&K'. No protest from Modi government. Complicit sell-out?" AICC chief spokesperson Randeep Surjewala tweeted. In a series of tweets on the issue, he said, "Modiji and BJP drumbeat and preach 'Pseudo Nationalism' everyday. India asks - why have you accepted US phrase of 'Indian administered J&K'?" Hitting out at the BJP-led NDA government, he said, "Empty chest thumping, false bravado and captive TV studio warfare by BJP government cannot hide its failures in compromising National Security". Mr Surjewala also said terrorism should never be politicised and a collective effort is needed to eradicate it, which should be sans partisan considerations. The Congress leader said one should remember that on June 2, 2006, the US imposed heavy sanctions on India's most wanted terrorist Dawood Ibrahim after a motion by then Congress-UPA government. He also said that on August 6, 2010, Pakistan-based Harkat-ul-Jihad-e-Islami (HuJI) was declared a designated terrorist organisation by the US, again by UPA's efforts. "On April 3, 2012 - US had put USD 10 million bounty on Lashkar-e-Taiba's Hafiz Saeed, wanted for the Mumbai 26/11 attacks, again by UPA's efforts," he said. The US last night declared Salahuddin, the chief of terrorist outfit Hizbul Mujahideen, as a "global terrorist", dealing a major blow to Pakistan just before Prime Minister Narendra Modi's first meeting with President Donald Trump. 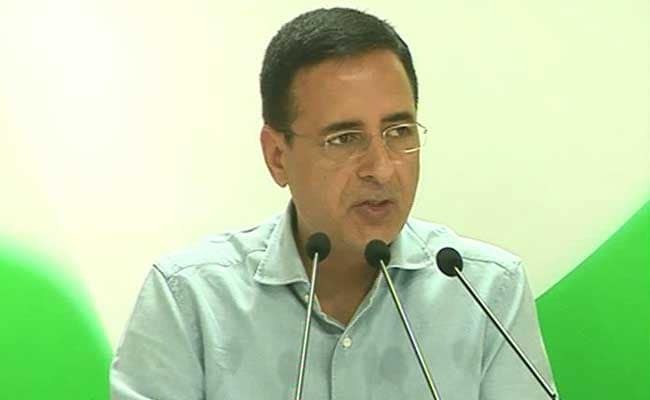 Citing part of the text on the US government's order, Mr Surjewala said it read: "In September 2016, Salahuddin vowed to block any peaceful resolution to the Kashmir conflict, threatened to train more Kashmiri suicide bombers and vowed to turn the Kashmir Valley 'into a graveyard for Indian forces'. Under Salahuddin's tenure as senior HM (Hizbul Mujahideen) leader, HM has claimed responsibility for several attacks, including the April 2014 explosives attack in Indian-administered Jammu and Kashmir, which injured 17 people," he said quoting the order.